87 Allen ave. my neighbors yard is so overgrown with grass, weeds and debris. The bugs and critters are living all over the yard. The pool is like swamp water and a dead animal has been seen floating around in it. we can not enjoy our back yard due to the smell and large amounts of bugs coming from that area. The Health Department will be out to inspect the pool issues. Thank you for the report and your concern. I live on McKay Street in South Attleboro. I've lived here for over a year now. I've notice that drivers speed on McKay Street. I have young kids who likes to play in our driveway but is afraid to because of drivers speeding up and down the street. Does anyone know how I can get Attleboro to do something about the speeding. We've stopped police cars and told them about the problem. I would like to see a Childen at Play sign or a Speed Hump Installed by the city but who do I contact to look into this speed problem. We don't have sidewalk on our street and our kids and neighbor hood kids walk to the bus stop, school and walk there dogs as drivers speed up and down the street. Please something needs to be done about the problem before someone gets hurt. Hello and thank you for listening to our concern. We noticed our trash wasn't picked up today. We did put it out next to our recycle bin. Will there be another pick up for us? I noticed I misspelled our address. Thank you for reporting this issue to the City of Attleboro. We have consulted with the contractor that performs pick up, Waste Management, and according to their records they missed picking up a trash barrel/recycling toter at the address you provided. Pickup will take place at the end of the drivers route the following day, or within 24 hours. We apologize for any and all inconvenience. Thank you so much for coming right out! Somebody came out today and picked it up! The sidewalk is pretty much completely deteriorated. Beginning at North Main, the sidewalk is all gravel and uneven; cracks and old concrete are prevalent. The streets are level with sidewalk in many places, notably at the intersection of Dean and Perrin (both corners). People walk in the middle of Perrin St in order to avoid sidewalk, especially families with strollers. The roadway is not draining properly. It is backing up over the sidewalk onto private driveway. It will cause severe icing conditions when it happens in the Winter. I saw it being reviewed. Tough time of the year to rectify now, hopefully in the Spring. Will probably have to wait until Spring due to the weather. There are many potholes at Slater St/Knight Ave. they are getting larger as the days go on. I figure maybe if I keep reporting they will do something, before they swallow my entire car! 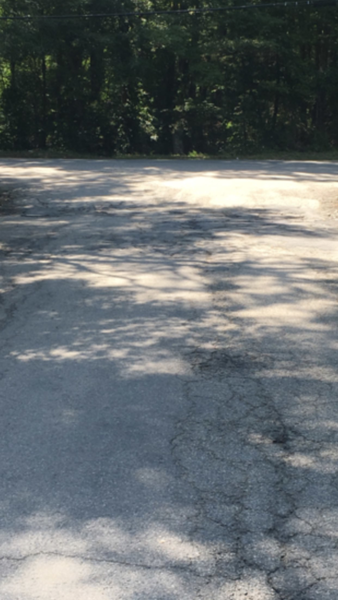 Picture from last summers failed repair at the numerous potholes and uneven pavement at this 100 ft piece of Attleboro public street (Knight St). This is truly an embarrassment to have such a short piece of road in this condition. This causes a hazard for vehicles while we have inclement weather and now that motorcycles will begin to ride our streets, it will cause a potential accident. Just replace this piece of road and stop with the excuses that the previous DPW Superintendent and administration continued to publish on this app. The Attleboro DPW should be embarrassed as to how this has been handled for the past several years. This is not something new..!! For some reason the other side of mulberry street was not swept by the city. Please have someone with the DPW sweep that side of the street. It is dangerous and unsightly. There is litter, inoperable motor vehicles, trash, appliances, organic matter completely covering the front and back lawns of the property, with vehicles on the street as well. There are holes in the roof, siding and windows. The interior of the property is delapatated, filthy and filled with litter and junk. There is no gas in service to the home for heat or cooking. There is substantial overgrowth on the side of the house. There are animals on the property including 2 dogs without rabies shots, one of which appear to be suffering from mange. And there are 3 young children living in these conditions! Hopefully it is referred to Department of Children and families and MSPCA too! Thank you for reporting your concern to the City of Attleboro. The Health Department is working on the rubbish issues. Other departments will be notified as necessary. The yard is deplorable and there is a man living in the run down camper!! Its been like this forever, nobody is doing anything!